Fantastic Value located in the Dr. PHILLIPS corridor of Conroy- Windermere Road. NEWER SEPTIC TANK AND FIELD-NEW POOL HEATER!!! Excellent location and security in this gated GEM of a community called "PARK SPRINGS." Great school district as researched, and many denominations/houses of worship nearby! So close to I-Drive, Convention Center and the OIA Airport is a straight shot down Sand Lake Road! 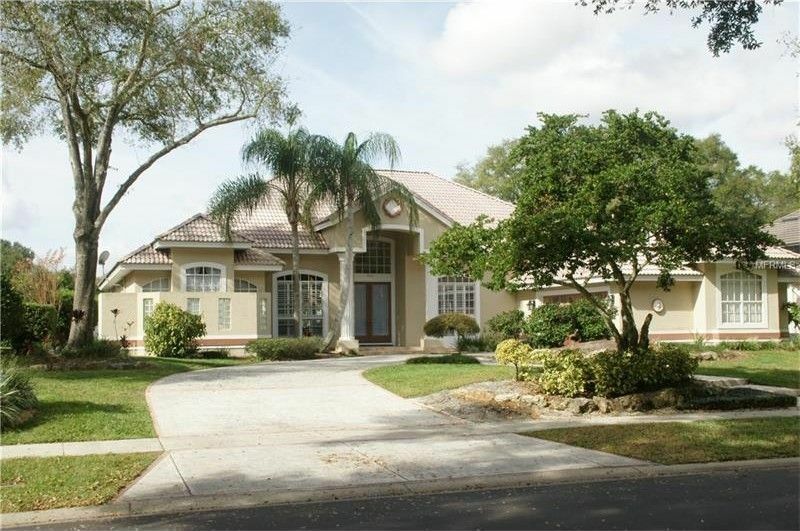 Circular drive/side entry garage and 4 bedrooms/3 baths and a lovely HEATED POOL with screened & covered patio/loggia make outside living simply 'SPLENDID" and one of the reasons which make Central Florida famous & well traveled !!! Split plan bedroom design, oversized master bedroom with adjacent separate office, bassinet-baby room, or early morning work-out room--allowing your mate to SLEEP IN! Master Bathroom with HIS and HERS sinks with redone shower, tile, floor and fixtures making it a pleasure to prepare one's self in the morning!!! Kitchen with solid surface stone counter tops & island, Chef's gourmet GAS COOKTOP for quick and easy food preparation, and generous use of windows and glass walls to allow natural light into the large great room/family room, dinette area, and bar seating at the prep area! FIREPLACE in the great room area take the occasional nip out of the air, and make for a great family holiday event!! TERMITE BOND WITH FALCON PEST CONTROL SERVICES, and an OLD REPUBLIC HOME PROTECTION WARRANTY PLAN (ORHP)--> ** FREE ** TO THE BUYER OF THIS LOVELY CUSTOM BUILT HOME! CALL TODAY! Driving Directions: I-4 TO SAND LAKE ROAD EXIT. GO RIGHT (WEST). TURN RIGHT (NORTH) AT 7-11 (TURKEY LAKE ROAD) AND DRIVE TO CONROY WINDERMERE ROAD AND TURN LEFT (WEST). RIGHT AT HIAWASSEE TO PARK SPRINGS (2nd) NEIGHBORHOOD ON OUR LEFT-GATED WITH DOME GUARD SHACK. THANKS!